Waking up to flower as the warmer, longer days of spring arrive—and the risk of a damaging frost recedes—requires a process called vernalization, in which flowering is blocked until the plant senses a sufficient cold spell. Researchers at the University of Wisconsin-Madison have identified a gene that keeps grasses from entering their flowering cycle until the season is right, a discovery that may help plant breeders and engineers get more from food and energy crops. "For many plants—some varieties of wheat are a good example—it's advantageous to get established in the fall but avoid flowering before it gets really cold," says Rick Amasino, a UW-Madison professor of biochemistry and genetics. "By becoming established in the fall, such plants can take full advantage of the window of the growing season when it opens in the spring." "Getting at the genetics underlying complex processes is difficult in many crop species, so we've used a small plant with a compact genome as a model to get at the molecular underpinnings of how a vernalization requirement is established," says Woods, first author on the study published Monday (June 5, 2017) in the journal Proceedings of the National Academy of Sciences. "What we found is a gene that represses the VRN1 gene prior to winter." Comparing the DNA of Brachypodium plants that abide by the typical cold-to-warm transition before flowering, to DNA from mutant versions of the grass that flower without the typical wait, pointed the researchers to a gene they're calling RVR1 (for its role in repressing VRN1). "Grasses—including corn, wheat, oats, rye and barley—provide more than 80 percent of our caloric intake worldwide," Woods says. "Rice alone in some countries is as high as 70 percent of the calories. But if you combine things we eat directly as well as animals we depend on that also eat grass, it is clear that grasses make the world go around." While the newly identified gene will likely be of interest to breeders of cereal grains, all those grass calories fuel more than bodies, says Amasino, whose work is supported by the National Science Foundation and the U.S. Department of Energy's Great Lakes Bioenergy Research Center (GLBRC). Switchgrass, which holds interest as feedstock for production of biofuels such as ethanol, doesn't bother with vernalization. It grows slowly and flowers in the early summer months in the upper Midwest. 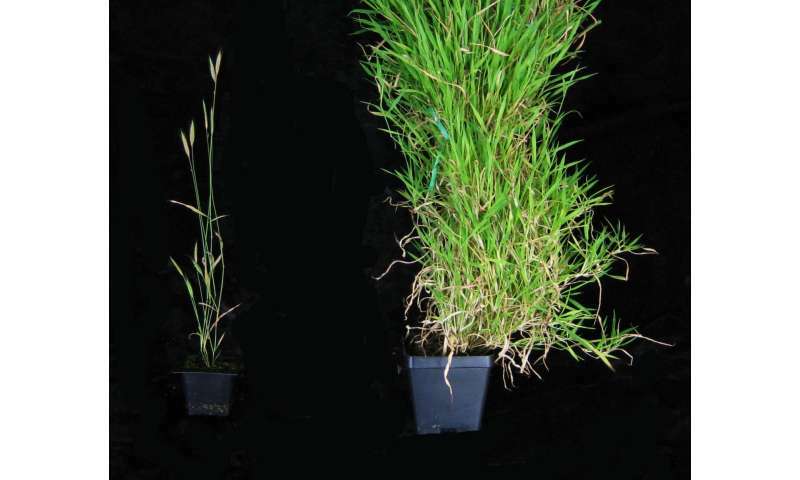 "We think there's a good chance that taking the RVR1 gene from Brachypodium and putting it in switchgrass will delay switchgrass flowering," Amasino says. "Delaying switchgrass flowering to various extents may affect and improve yield." Amasino's lab will partner with GLBRC researchers on that work, and will continue to study different types of Brachypodium adapted to winters spanning a range of temperatures and lengths. "How did one variety evolve a system tweaked to require 16 weeks of cold? How did another one develop for just two weeks of cold? What's the genetic difference between the requirement for a short winter versus a long winter?" Amasino says. "Grasses are really important crops, and this model for studying flowering can tell us a lot about how they work."